The point of greatest eclipse (totality phase during 4 min 9 sec) was located in the middle of the Pacific Ocean east of Indonesia where about 10 million people lived inside the totality path. To observe the 2016 March 8-9 total solar eclipse, I proposed tours only in eastern Indonesia, in the Northern Maluku, where the ground weather prospects were the best and the duration the longest. However the local infrastructure was fairly limited. The Woleai atoll, belonging to Micronesia, was offering the longest land-based duration very close to its maximum but its airstrip was out of order so the logistics would have been far too complex even though going there on a boat was a possibility. There were numerous viewing locations along the path, however paying close attention to the weather patterns and local terrain topography was mandatory unless you were on a cruise ship in the Pacific Ocean where the sky was usually clearer. Moreover the 2015-2016 El Niño episode did somewhat improve the weather prospects in Indonesia. Page "Introduction" | Page "Scouting" | This is page "Eclipse" | Page "Google Map" | Page "Weather" | Page "Gerhana Matahari"
To maximize the chances to have seen this eclipse, using an aircraft able to fly above the clouds could prove essential. This was why a new private stratospheric eclipse flight from Ternate or Buli, Indonesia, was planned. Two aircrafts were selected, one of them being again the Dassault Falcon 7X business jet which was previously used during the 2015 March 20 total solar eclipse. 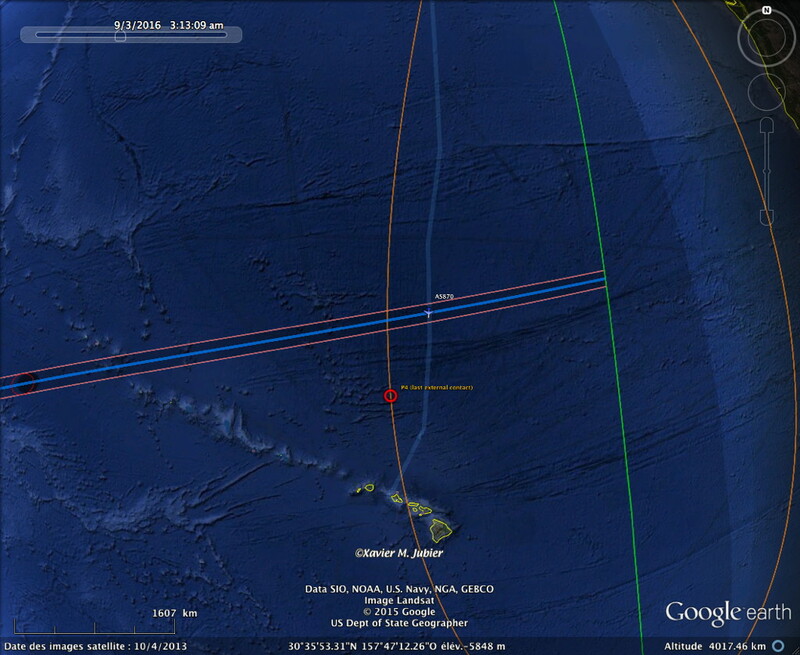 Three commercial flights, two from Garuda Indonesia and one from Alaska Airlines, crossed the eclipse path either over Indonesia or north of Hawaii. It was of course difficult to guarantee anything in this later case because the flights may well have been late or else have taken a slightly different route than the one planned. Having an agreement with the airlines operating the flights was key to success. Well over a year before the event, Joe Rao did contact Alaska Airlines to offer the opportunity to observe the eclipse from a B737-800 scheduled commercial flight. The B737-800 flight was AS870 traveling from Anchorage, AK, to Honolulu, HI, on March 8th (not on the 9th because we were east of the international dateline); the aircraft was later changed to a B737-900ER. The flight plan did not require any major modification, only the departure time needed to be delayed by about 25 minutes, to offer a view of totality for 1 minute and 59 seconds on the right side of the aircraft with the black Sun at 10 degrees of elevation. 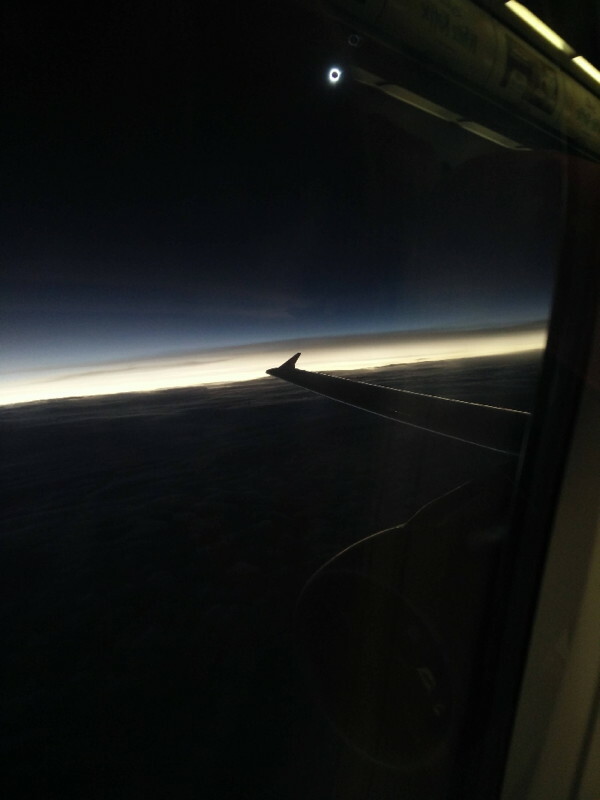 On March 8, 2016, Mike Kentrianakis (2017 Solar Eclipse Project Manager at American Astronomical Society), Joe Rao, Dan McGlaun, Craig Small, Evan Zucker, Robert Stephens, Lindsay Adams and a couple of eclipse chasers were onboard flight AS870 as it was engulfed into the umbral shadow of the Moon. One of the interest of this particular eclipse flight was that one could see the shadow coming straight at you which is far more impressive than sideways. Moreover at the intercept point the whole width of the elongated shadow was small enough to be seen onto the clouds top, an experience somewhat similar to the marvelous HSE 2013 eclipse flight in a Falcon 900B. Garuda Indonesia offered the opportunity to observe the eclipse from at least one B737-800NG scheduled commercial flight over Indonesia. The flight plan required a slight modification that could easily be implemented to offer a view of totality for 2 minutes and 27 seconds on the left side of the aircraft with the black Sun at 38 degrees elevation or else 3 minutes and 3 seconds for passengers on the right side with a more major modification. Although the aircrafts were ready to take off those two eclipse flights did not take place in the end, the ground weather being deemed good enough. To have an idea of one of the two flights you can read a more detailed description. Last page update on March 25, 2016.